In the mist of all this “construction” (as I like to call it), I have managed to get out and search for the perfect accent pieces to really make our updated bedrooms pop! 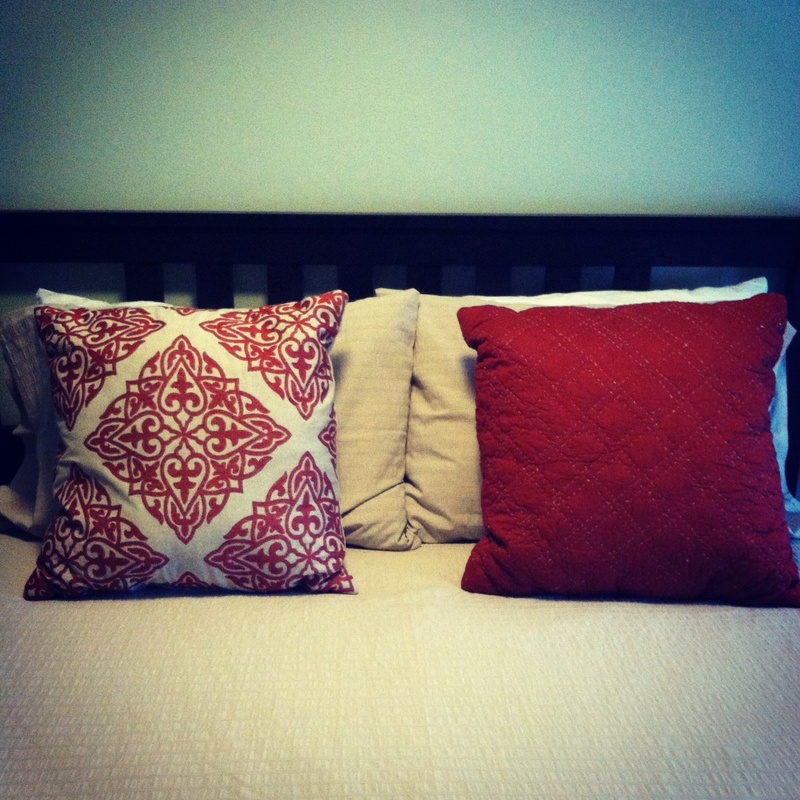 Target, Home Goods and Bed, Bath and Beyond, have become some of my new favorite stores. I can never seem to leave without purchasing something. I found this at Home Goods and LOVE it. 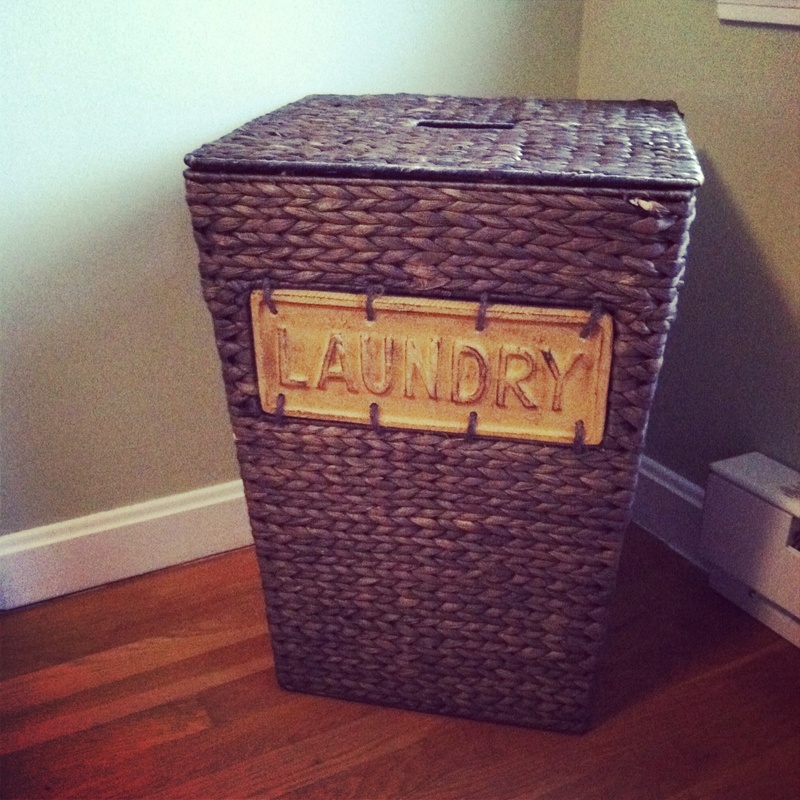 Justin doesn’t understand why we would have a laundry bin in the guest room. Ladies, am I right here? I love accenting with bold colors that really compliment the wall color. I can’t wait to get my hands on our office next. I’ve decided to accent the blue walls with… ORANGE! Justin and I learned today that we have very different definitions of what “complete” means. When a room is painted except for a few touch-ups here and there and the majority of the work is done, I’m ready to check it off the list. Justin does not consider a room to be complete until there are pictures on the wall. I have to say, I like his definition more than my own, as it keeps us a bit more focused. 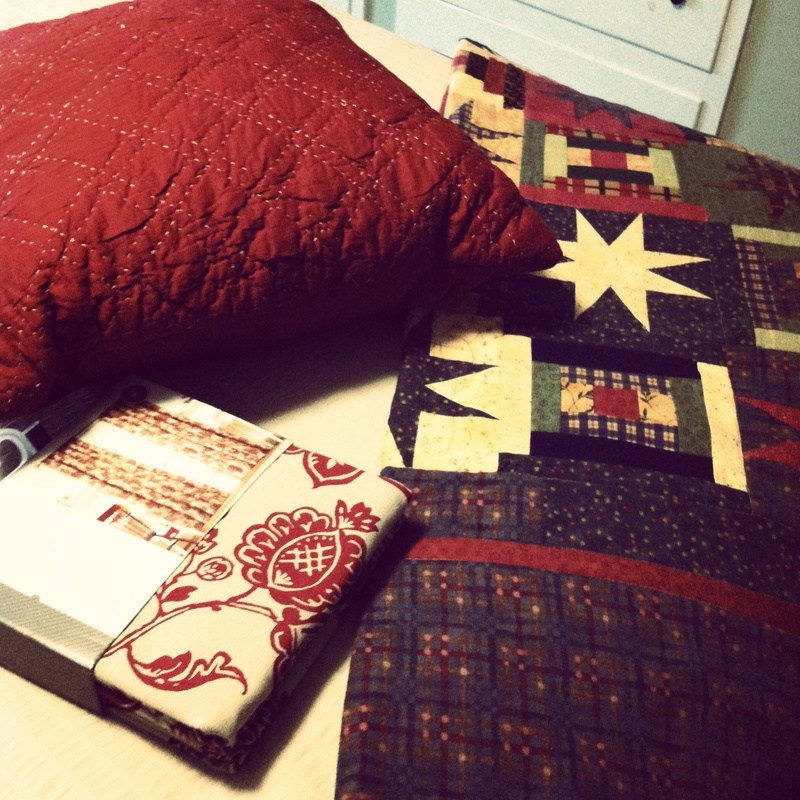 However, I can’t wait to move on to the next project! Today Justin and I finished the majority of the painting in the office. There are two spots that need a touch-up. 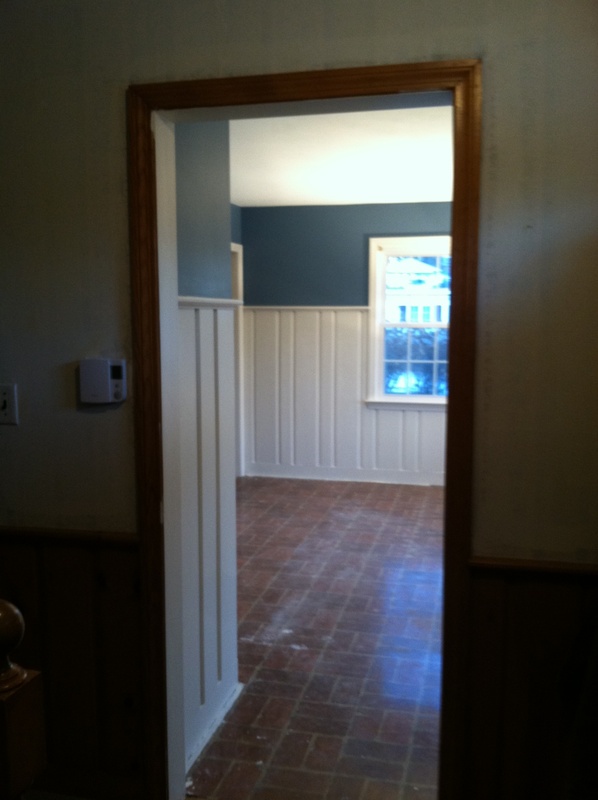 We have outlets and light switches to change out. Aside from that, our work here is done. The last and final (and possibly most important) piece that we are waiting for is the new carpet. 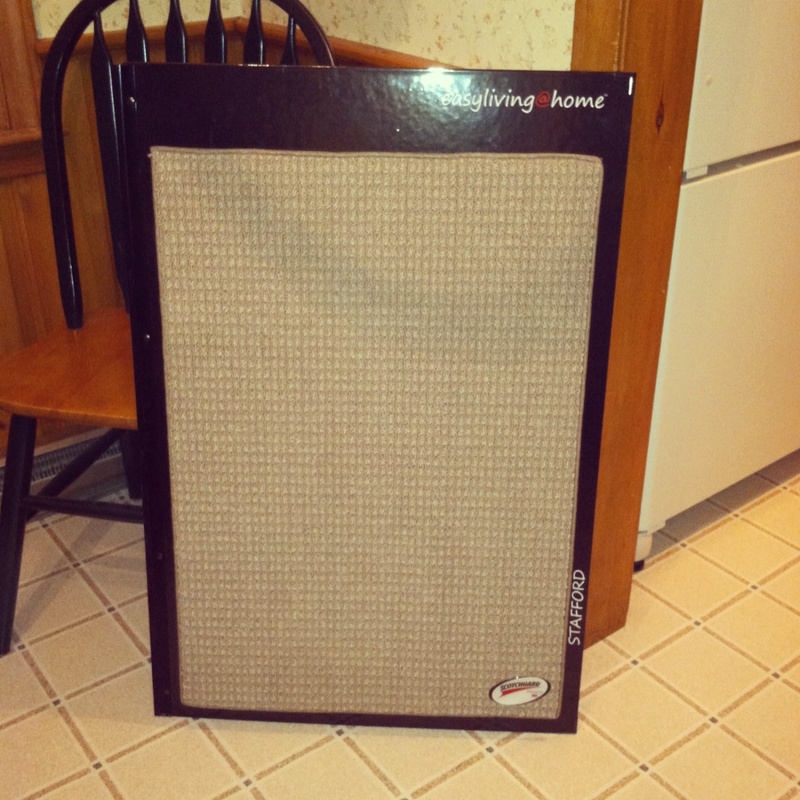 It has been ordered and I should hear tomorrow when we should expect it to arrive. We can’t wait! Each and every time we’ve “completed” a room (this is our fourth), it becomes my new favorite room and by far “the biggest transformation” yet. I have to say though, this room really does hold true to being my favorite and the biggest transformation yet (until the next one, I’m sure). I am so impressed with how it turned out and very relieved! 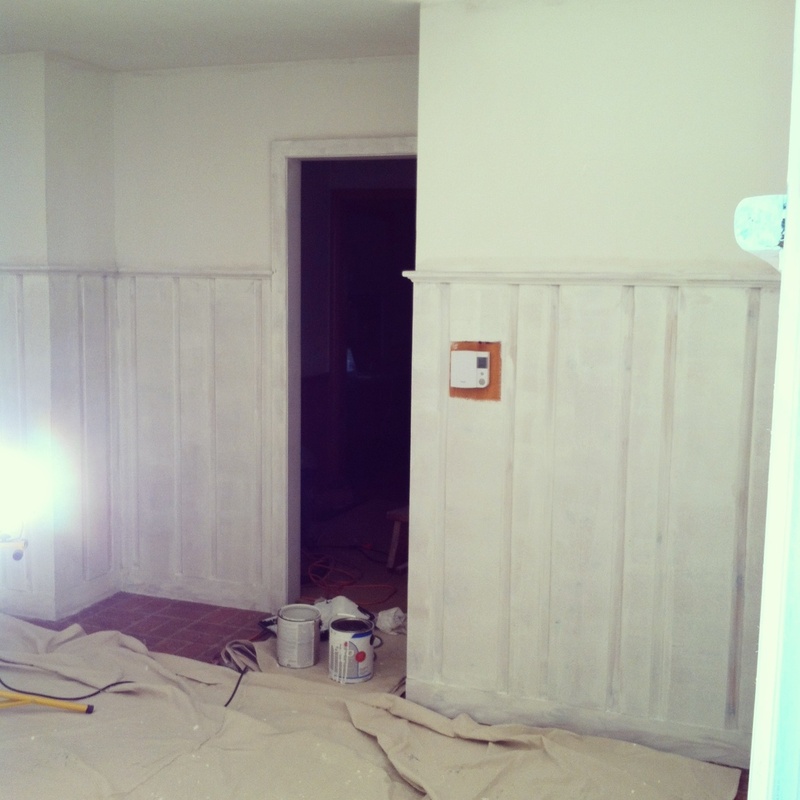 Without telling one another, Justin and I were both holding our breath a bit when it came to the wainscoting. Here we are scuffing up and painting over with what we hope, are good and reliable products, this gorgeous wood that we would never be able to afford if it wasn’t already here. 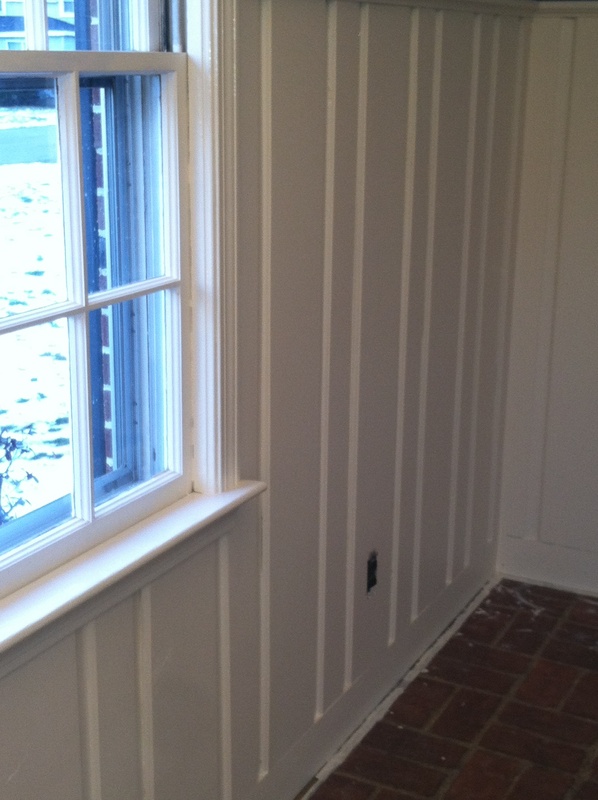 After two coats of Valspar “Antique White,” we were grinning ear to ear with the results. It looks incredible! It feels crisp, clean and completely updated! 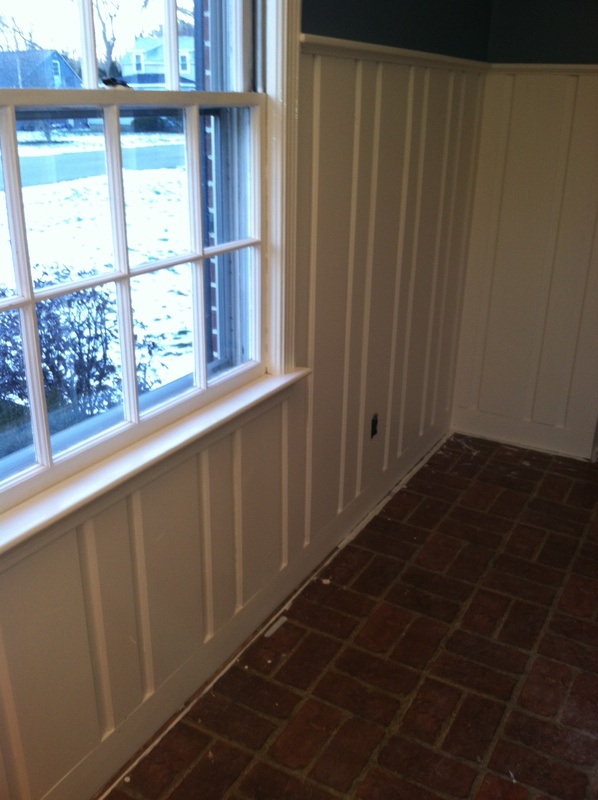 There were many gaps between the boards that we took care of with a bit of caulking. It was a small thing to do, but made a HUGE difference. The last picture I’ll share with you is taken from our hallway. 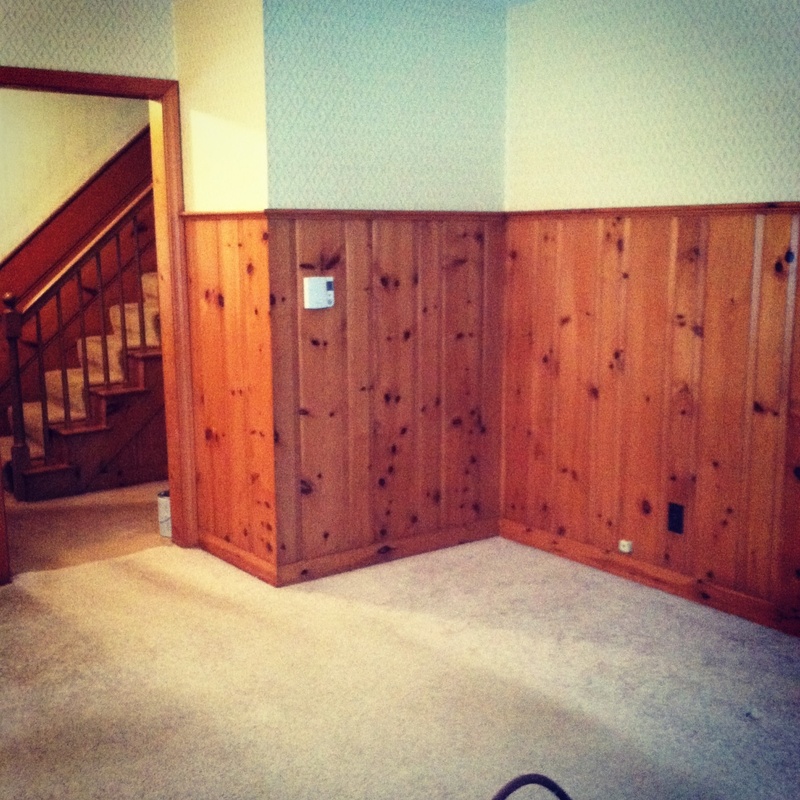 Justin pointed out that looking at the room from the hall, where there is half-stripped wallpaper and the dark oak wainscoting, it really shows how updated this room now looks compared to the rest of the house. 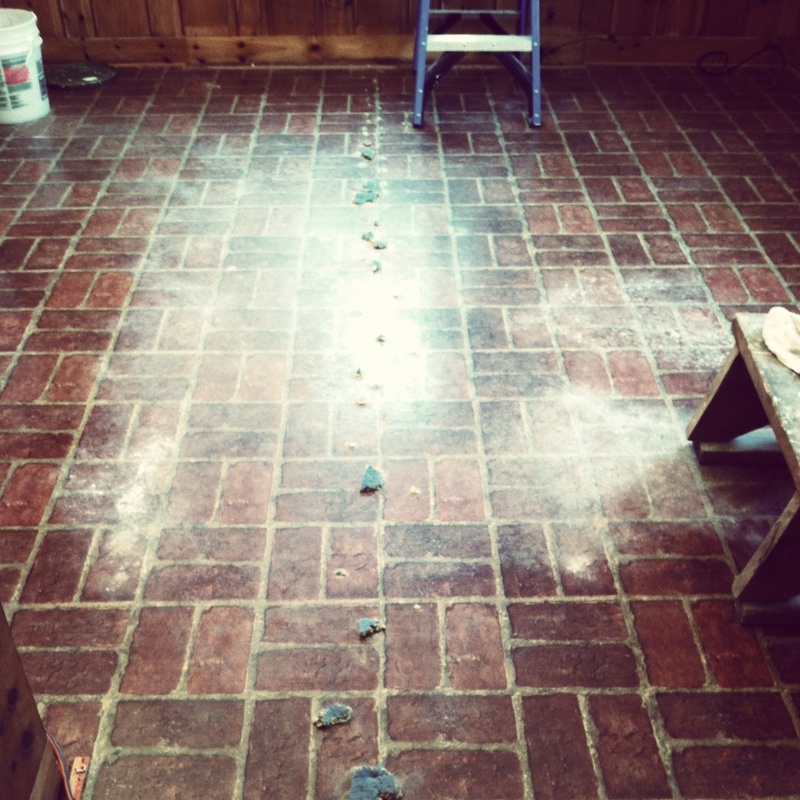 And although this room isn’t quite “complete,” it makes me all the more motivated for the next project! Faux brick linoleum. 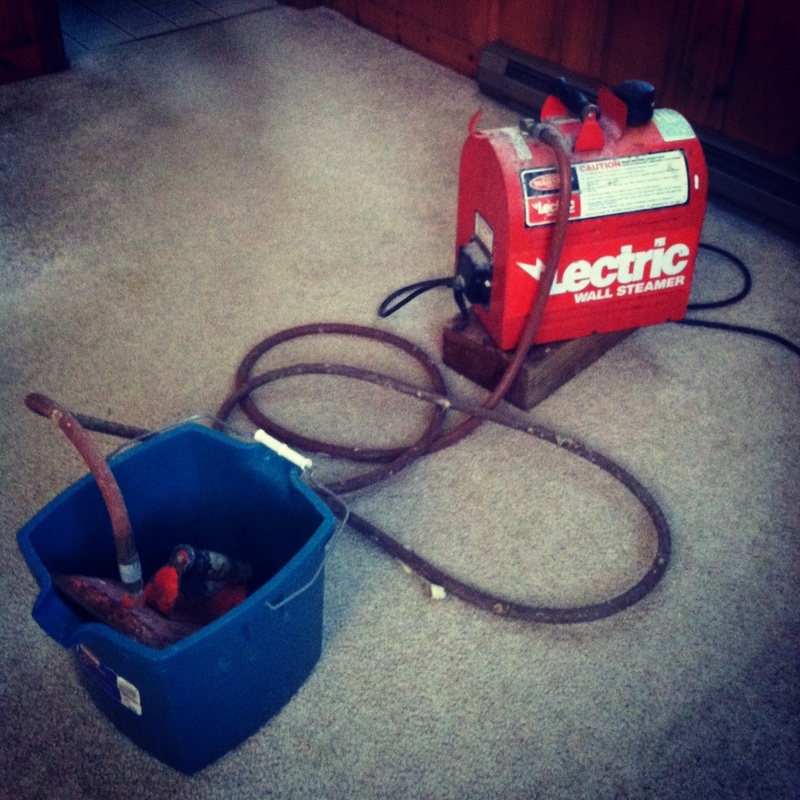 This is what we found after tearing up the carpet in our office, after a last minute decision to start renovating this room. Now I should probably start by saying that Justin and I were supposed to be in skiing in VT this weekend. After a last minute decision to stay put due to pure exhaustion and the “sniffles” (Justin worked 62 hours this week & I have been surrounded by everything from pneumonia to bronchitis at school), we surprised ourselves by spontaneously deciding, “Hey, let’s paint the office!” We have done little house projects the past two weeks, some of which include decorating the guest room and installing a light in the garage, so I guess you could say we were itching for our next big project. We were planning to paint the hallway, which will still be a major transformation, however are not 100% sure as to how we’re going to get away with painting over wallpaper, I’ll post separately about this later! We have known what we’d like to do in the office for a long time, and seeing as how we recently bought and put together our new desk from Ikea (which we love) we figured this would be just as great and something we could handle in a short amount of time. This room had two layers of wallpaper (surprised?). It was fairly easy to take down and really only took a few hours with the steamer. Only a third of the walls were covered with it, so the job was much more manageable for a “last-minute project.” I’ve discovered after a brief vacation from stripping wallpaper, that my least favorite part of taking it down is washing the walls afterwards. They are glue-y, sticky and just a mess! We’ve been using hot water with a bit of fabric softener mixed it. Although it really isn’t fun, the fabric softener makes the room smell great, and stays that way too (ours rooms upstairs always smell so fresh)! You should know that I decided to “Instagram” my photos. 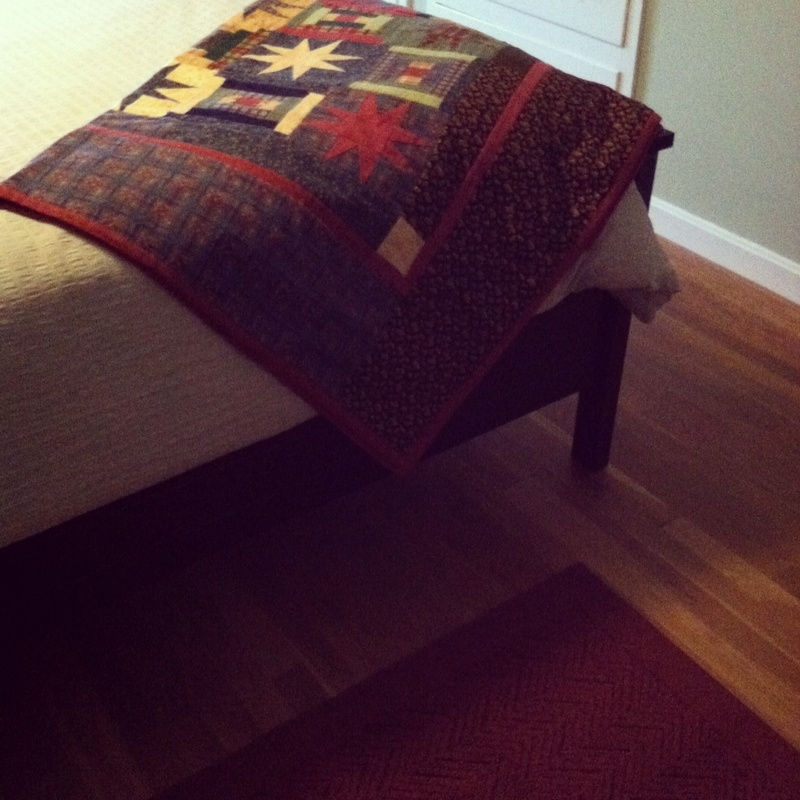 I read an article from another blogger that does the same, and I felt it would almost give the space more justice! And my trusty old friend! I swear by this thing. If you ever have to strip wallpaper, we’ve found that a steamer is the fastest and least frustrating way to do so. We’ve borrowed ours from a friend, so it hasn’t cost us anything. However I’m assuming even to rent one or buy one depending on the amount of wallpaper you need to strip, would be a fraction of what you would have to purchase in wallpaper removal products or fabric softener. 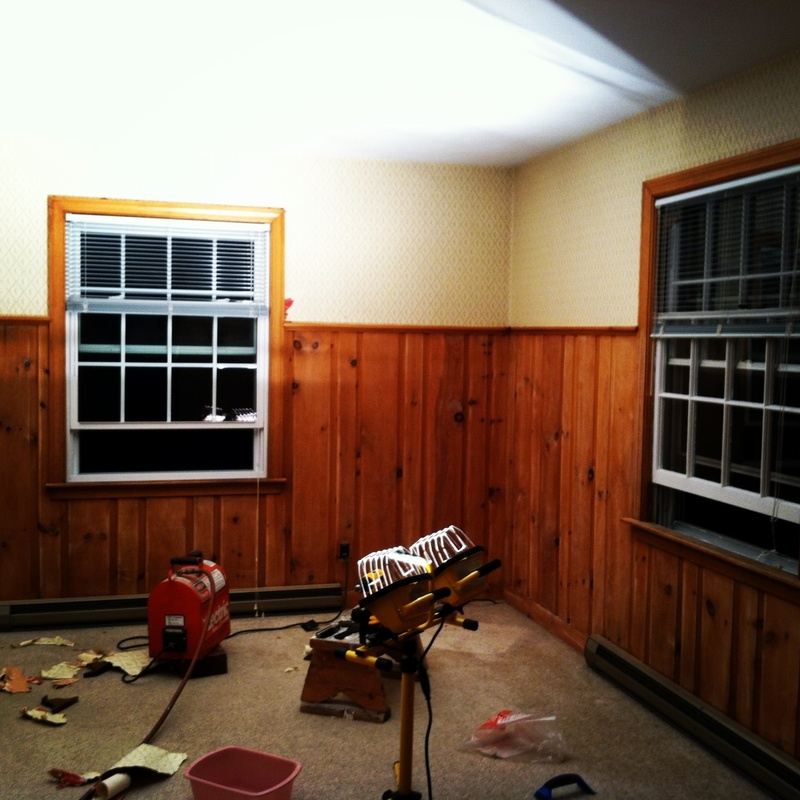 As I stripped wallpaper, Justin sanded down the wainscoting. 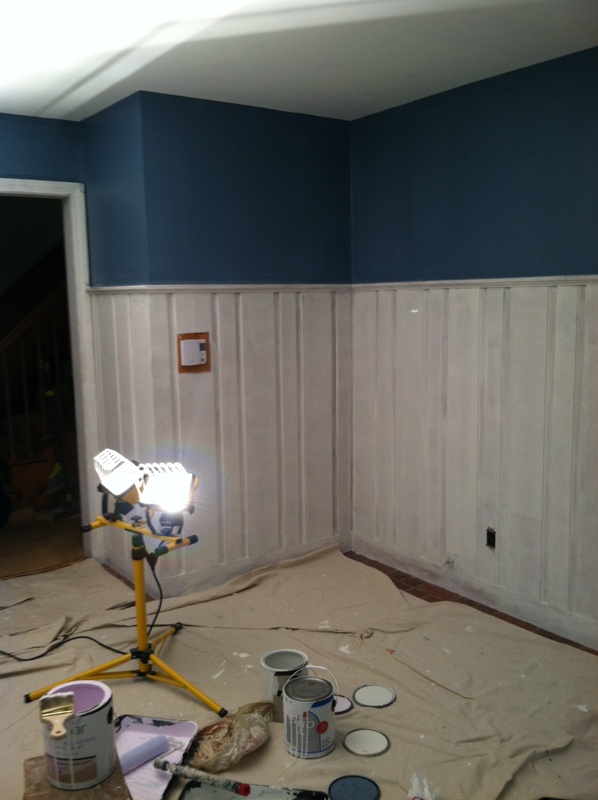 We knew when we bought the house we wanted to keep the wainscoting. It’s beautiful, and really gives that “beach house” feel that we’re going for. We also knew that we wanted to paint it. As soon as possible. Figuring out the best way to this was something we had to research. We knew that above all else, we did not want the paint to chip somewhere down the road. 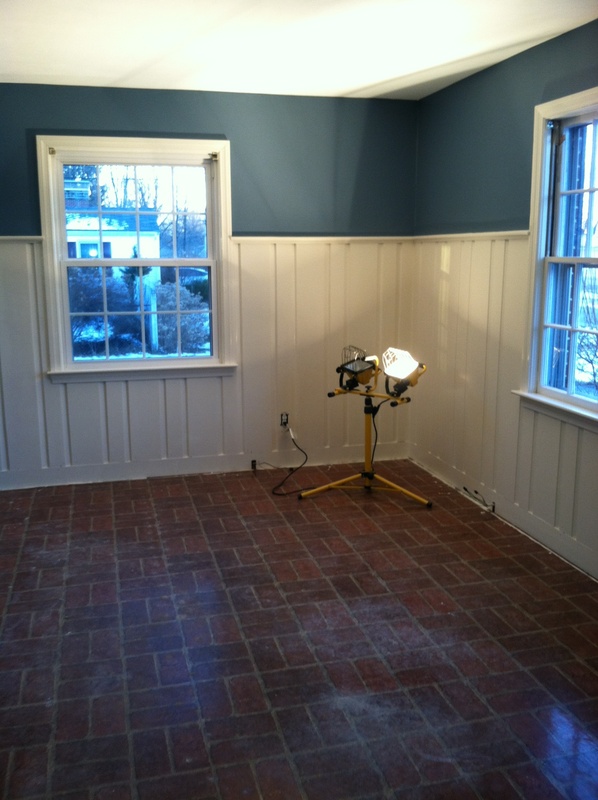 We started by sanding the walls with 220-grit sandpaper. Once this was done, we washed them down with warm water and a small amount of dish soap. Next we washed the wood with warm water and a bit of vinegar. This removed any soap residue leftover. 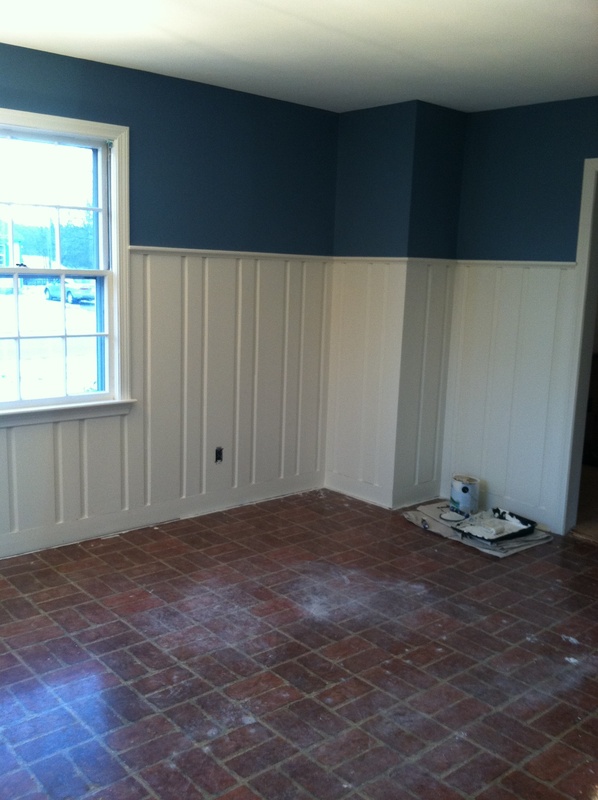 It was important for us to wait on this however, after the walls had been cleared of wallpaper, washed, spackled, and sanded. 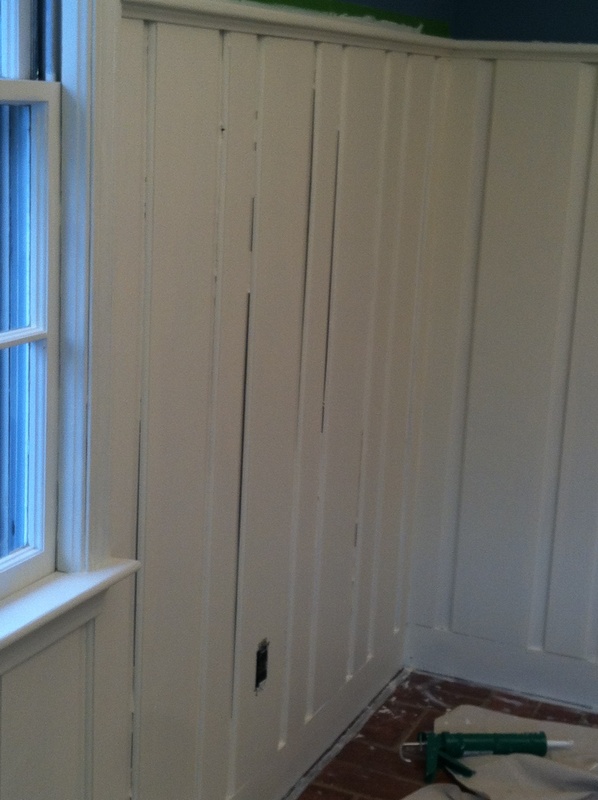 Otherwise, the dust from sanding would have landed on the wainscoting. 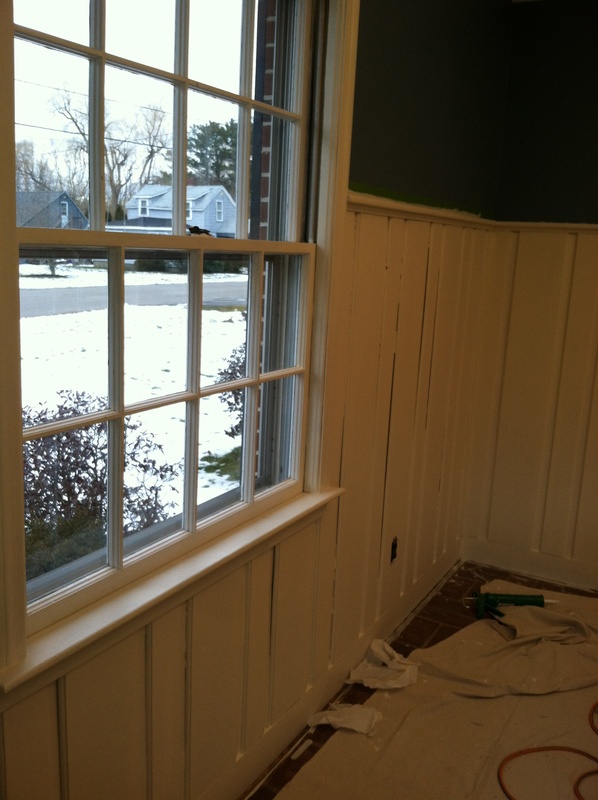 Once the walls were washed and ready to paint, we primed the top and put an oil-based primer, Kilz, on the wainscoting. 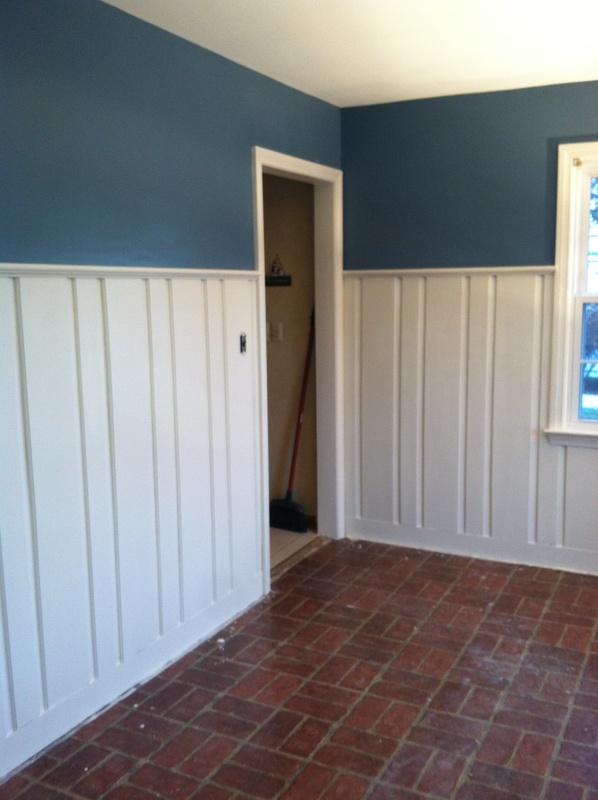 This took a while, because there are divets in the wainscoting which prevents a roller from easily doing the job. I took a brush and painted all of the indented pieces, while Justin painted the chair rail and followed me with the roller. The oil based primer also had a very strong smell to it, but fortunately it was mild enough today where we could keep the windows open. 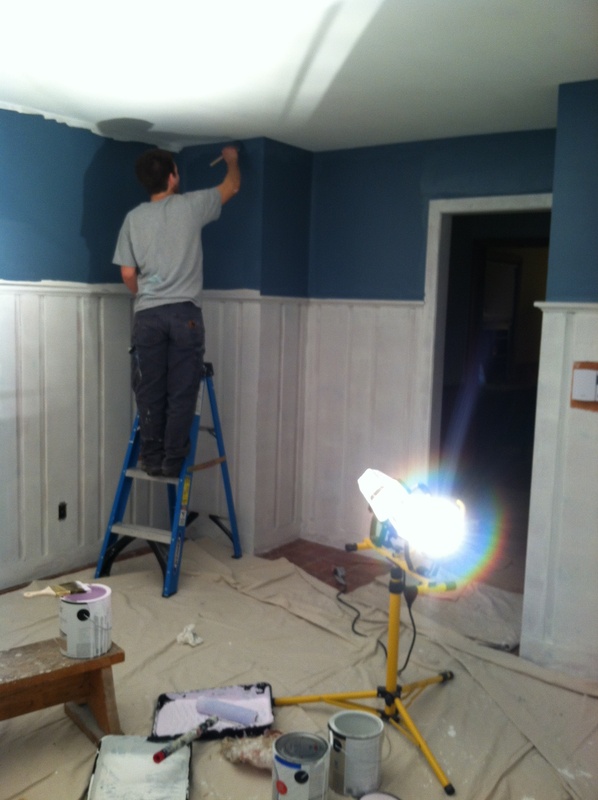 Once the walls and wainscoting were primed and the ceiling was given a fresh coat, we painted the top walls with a dark blue. It has such a beachy feel that we love! 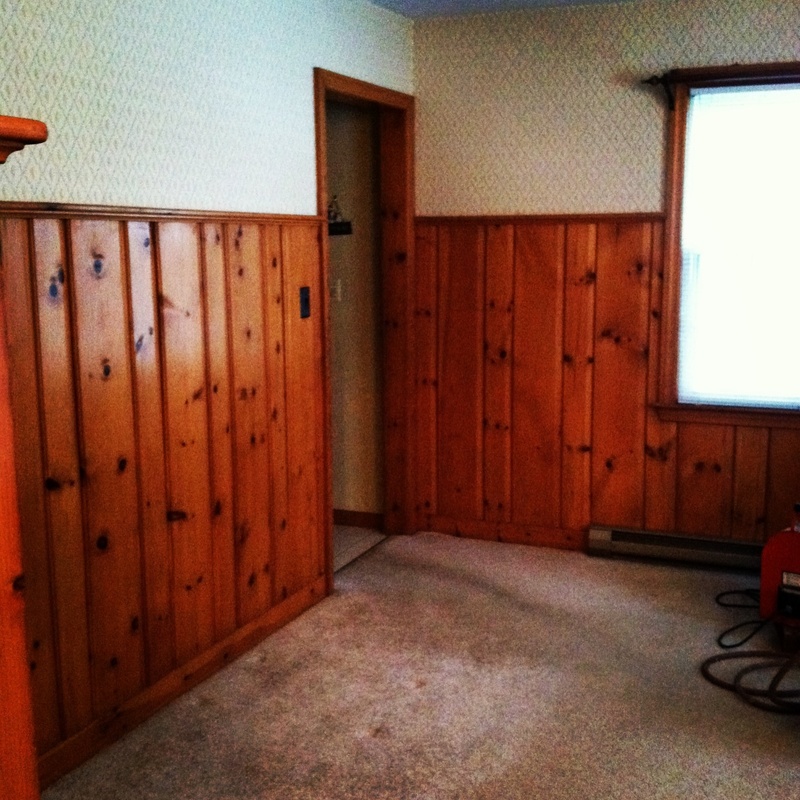 We plan to paint the wainscoting soon and replace our ever-so-wonderful brick linoleum with, dun da da da!